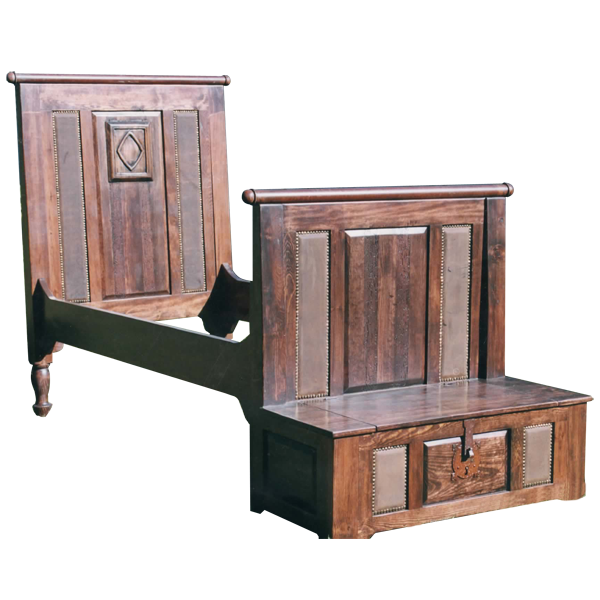 This marvelous, handcrafted, Spanish colonial style bed combines practical functionality with a gorgeous design. Attached to the bed´s footboard is a spacious trunk that can be used for practical storage and for additional seating. The bed has a solid wood, rectangular headboard with a matching footboard, and the front of both are adorned with three, rectangular cut panels. The headboard´s large, center, rectangular panel is also embellished with a hand carved, diamond design. The rectangular, side panels on the front of the headboard and on the footboard are covered with rich, brown, full grain leather, and the leather is hand tacked to the frame with beautiful, gilt nails. The top of the headboard and the footboard are both accented with a decorative, hand forged, iron bar. Incorporated into the footboard is a trunk, and the front of the trunk is enhanced with matching, rectangular cut panels. The trunk´s front, side panels are covered with matching, leather upholstery, and the leather is hand tacked to the frame with gilt nails. 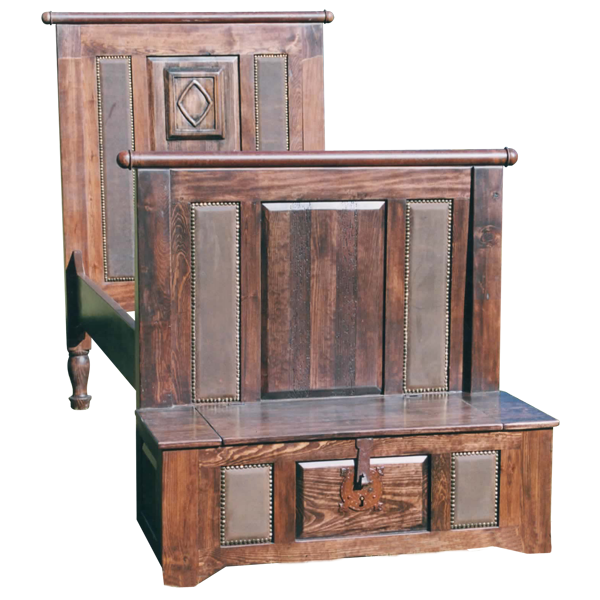 The trunk has a hand forged, iron latch in its center, and it rest on square cut feet. The headboard is supported by elegant, hand turned legs, and it has an antique finish. The bed has solid wood, side rails, and it is 100% customizable.